In Historic New England’s conservation lab, our staff is always testing better ways to care for the nation’s most extensive collection of New England antiques. 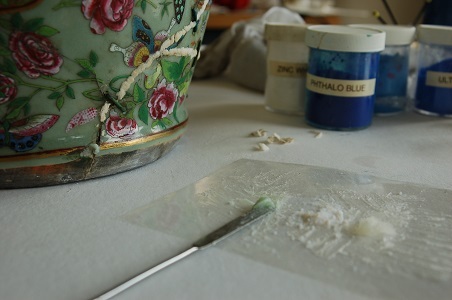 Conservators recently had the opportunity to use an alternative technique during treatment of a Chinese export porcelain vase. The natural translucency of glazed porcelain can be difficult to match using standard ceramic fill materials, like plaster. An alternative is clear epoxy, which is often used to cast missing pieces of glass. To create a fill for porcelain, conservators bulk the epoxy with fumed silica, making a stiff paste. Dry pigments are mixed with small portions of the bulked epoxy, and each color is added separately to match the overall tint. Prior to treatment, this porcelain vase was missing portions of its rim. 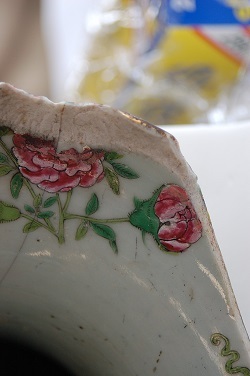 It had several small chips at the junctures of previously repaired cracks and numerous losses of its enamel overglaze. Historic New England conservators used bulked epoxy to create fills of varying sizes, then sanded and polished them to blend with the surrounding porcelain. Areas of glaze loss were painted in using acrylic paints mixed with a semi-glossy acrylic medium to match the body and sheen of enamel. 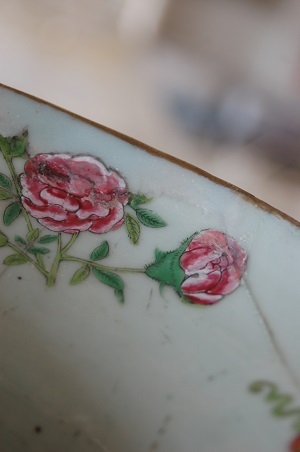 Prior to filling, conservators consolidated all areas of loss using a reversible adhesive resin. This created a solvent-soluble barrier layer that will allow the fills to be removed if necessary in the future. This vase will soon join its twin on display at Historic New England’s Quincy House. Help Historic New England preserve and share objects like these by making a gift to the Collections and Conservation Fund.